MANILA, Philippines - Filipino bloggers above 18 who have at least 5,000 followers on any social media platform can get accreditation to cover President Rodrigo Duterte’s events. 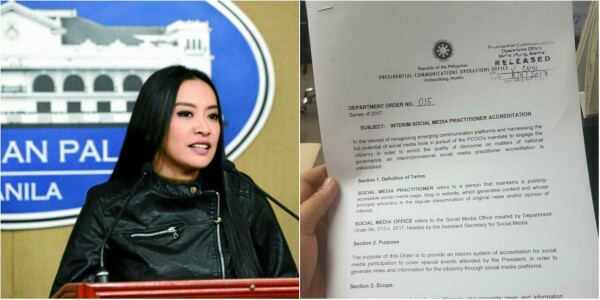 Interested individuals may apply for accreditation at the Social Media Office (SMO), which is headed by PCOO Assistant Secretary and celebrity blogger Mocha Uson, a staunch supporter of Duterte. Uson will handle the accreditation process and monitor the policy which will be given a “test run” for 6 months. Accreditation, which is free and voluntary, will be issued on a per-event or per-activity basis only, unless specified, and will be subject to clearance from the Presidential Security Group (PSG). Accreditation can be withdrawn, suspended or cancelled if the blogger abuses rights and privileges extended by the PCOO or if he or she improperly uses the accreditation. Previously, the PCOO was criticized by media practitioners for giving accreditation to Atty. Bruce Rivera, a known supporter of the Duterte administration, to cover the recent ASEAN Ministerial Meetings. Andanar explained that Rivera and several bloggers were accredited to cover the said event and help promote the meetings on social media.